Newmedical offers both professional and consumer lines of products to improve the appearance of scars and other post-procedure, post-surgical, post-burn and post-trauma symptoms. Our mission is to offer physicians and patients the highest quality, most effective solutions to achieve the best aesthetic results possible. Not only do our products enhance results, they also speed the recovery process to minimize patient down time post-procedure. 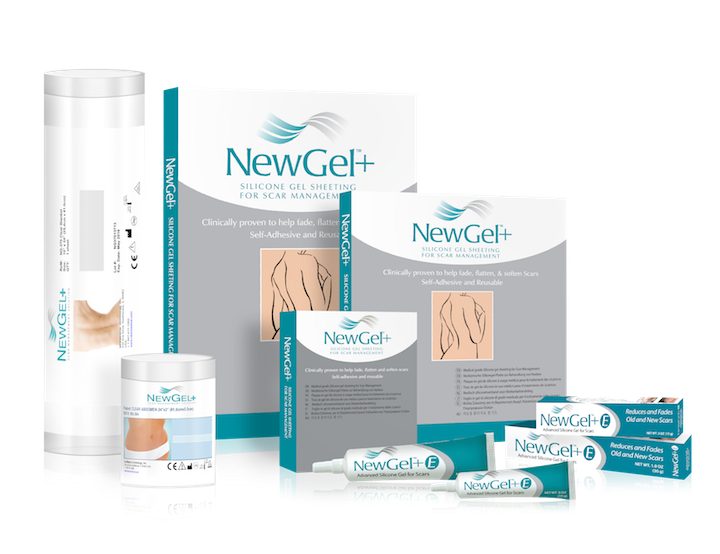 NewGel+ scar treatment products were created with the advice of physicians, and are used in clinics and hospitals around the world. NewGel+ sheeting and the gel help reduce the chance of abnormal scars after surgery, burn or trauma, and can also improve the appearance of older scars by flattening, softening and reducing redness. NewGel+ improves more than just appearance—it helps restore confidence and makes scars almost forgettable! C-section, open heart surgery, cleft lip, thyroidectomy, skin cancer surgery, mastectomy/reconstruction, and orthopedic surgery patients and their physicians trust NewGel+ for scars of all shapes and sizes. Our NewGel+ sheeting is made with medical grade silicone and is superior to other consumer silicone sheets, especially those you find in the pharmacy. NewGel+ sheeting, strips and shapes are more durable, adhere better, and comes in a wider variety of sizes and shapes to fit your scar than other brands. Dermatologists, OBGYNs, Orthopedic Surgeons, Nurses, Physical Therapists, Estheticians, and many other professionals. BruiseMD is all natural, gluten-free, vegan, and cruelty free. Silagen® is the first and only comprehensive line of physician-exclusive, medical grade silicone scar therapies. The Silagen Scar Refinement System includes both silicone gels and sheeting. The gel options include both 100% Pure Silicone Gel and Silicone Gel + SPF30 (both available in high quality 15g and 30g airless pumps). Silagen® gels have a silky feel and quick drying time, and are preferred by 98% of physicians over the leading professional scar gel. The Silagen® System also offers a wide variety of silicone gel sheets, strips and shapes. Advanced adhesion technology, combined with optimal silicone thickness, makes this the preferred brand of silicone sheeting due to its flexibility and durability. Silagen® offers a product to fit every scar, and to meet every physician’s needs. Silagen® refines scars by softening and flattening them, while reducing redness and improving the overall appearance of the scar. The mission of the Silagen Rapid Recovery System is to ease post-procedural symptoms and reduce patient down time following procedures. Silagen Arnica Bromelain Complex Supplements helps to reduce swelling and bruising following surgery, dermal fillers, and many other cosmetic procedures. They are all natural and offer a seven day course of therapy in each bottle. Silagen Topical Recovery Gel includes 20% herbal Arnica montana as well as 1.5% Vitamin K oxide to help speed the recovery process after procedures. It also contains other vitamins, bromelain, moisturizers, penetration enhancers and soothing agents to increase patient comfort. All silicone formula – no other potentially irritating ingredients are included. Physicians surveyed preferred the silky feel and faster drying time of Silagen® Silicone Gel over a competing professional silicone gel. Physician exclusive- only available from medical professionals. Available in 12 shapes and sizes specifically designed for the needs of plastic surgeons and dermatologists. Silagen® products are NOT sold directly to patients, they are sold to authorized physician offices. The sale of Silagen® products is limited to authorized physician offices for multiple reasons including concerns for the safety and health of the patient. Please contact your physician to purchase or call us to find a Silagen®-stocked office near you. Any online sale of Silagen® products is strictly prohibited. Silagen® authorized dealers are chosen for their capability to properly advise patients on the proper medical application of Silagen® products and their ability to correctly represent Silagen® products. The warranty for Silagen® products only applies to products sold by authorized dealers, none of which are authorized to sell online. Unfortunately, unauthorized third parties have been found to sell Silagen® products online. Silagen® products are not to be sold by online retailers. Silagen® products sold by unauthorized third parties should not be considered as being bought from NewMedical Technology, Inc. Due to the nature of the Silagen® brand products and their disposition, including their medical application, goods sold by unauthorized third parties are not covered by our warranty. Silagen® is taking steps (such as this warning) to combat unauthorized entities from selling the Silagen® brand products. Silagen® goods sold by unauthorized entities are at times purchased on the “gray” market and may be defective or stolen goods. We urge all consumers to use due diligence when purchasing Silagen® brand products. Use of products that are not sold directly by authorized physician office may pose health risks and be potentially dangerous. ONLINE SALES OF Silagen® PRODUCTS, INCLUDING BUT NOT LIMITED TO SALES FROM AMAZON AND EBAY, IS PROHIBITED AND SUCH GOODS ARE NOT COVERED BY OUR WARRANTY.